We're very excited to announce that our Mac app now has whitelisting functionality via Freedom Website Exceptions! Make sure that "Enable Website Exceptions" is checked. 2. Click "Add Site" and enter as many sites as you'd like. The GIF below shows how to add sites to the exceptions list. For the purpose of this tutorial, we are adding facebook.com and bbc.com to our list. You can make your exceptions fairly granular. If you want to allow the whole site, you can add the URL (bbc.com). But if you only wanted to allow one section of the website (bbc.com/radio), just add that section. In that case, you'll be able to access bbc.com/radio, but you won't be able to access the rest of bbc.com. 3. Start a session -- the sites on your exception list are now whitelisted! Note: Currently, Exceptions work on Chrome and Safari only -- other browsers will be hidden during sessions when you have "Website Exceptions Enabled" checked. Q. Do I have to run a "Block All Websites" session for Website Exceptions to work? A. 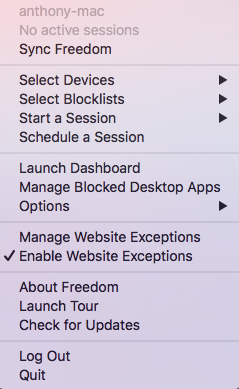 You can use Website Exceptions with both Block All Websites sessions and sessions that only use your customized blocklists! Sites will be whitelisted for both setups. Q. Can I add sites to my exceptions list during a block session? A. 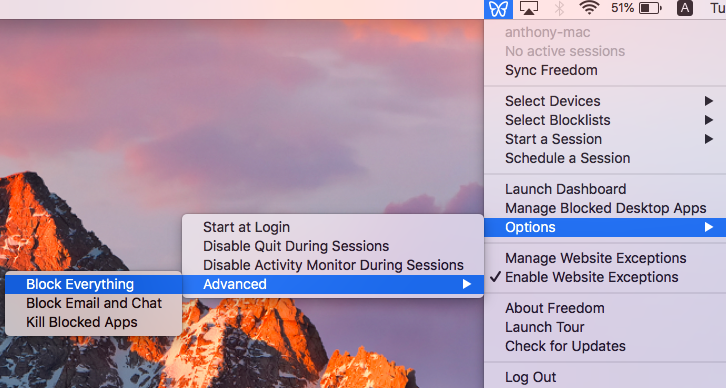 To avoid "cheating" or getting around your pre-determined blocks, website exceptions cannot be added during active sessions. Q. Is Website Exceptions coming to Windows? A. Yes! Because of differences between the two operating systems, Windows whitelisting will take a little longer to develop and implement. We're making this a priority and we hope to get Website Exceptions added to the Windows app ASAP! Q. 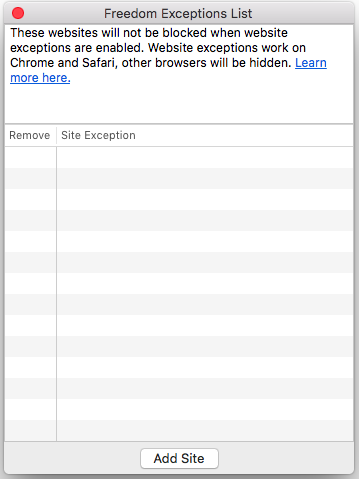 Why are my other browsers blocked when I use Website Exceptions? A. Currently, Exceptions work on Chrome and Safari only -- other browsers will be hidden during sessions when you have "Enable Website Exceptions" checked and you will not be able to open them unless you uncheck "Enable Website Exceptions". Q. I set up Website Exceptions but it doesn't work! A. Make sure "Block Everything" from the advanced options menu is not checked. If you're having any issues, just send us a message via the green chat bubble in the bottom right corner of the site or shoot us an email at support@freedom.to and we'll be happy to help.